Evergreen perennial; stems horizontal, long-creeping, branched; erect branches with numerous leaves, 5-25 cm tall. Linear-lanceolate, 3-10 mm long, with 1-3 small irregular teeth close to the tips, the tips without bristles. 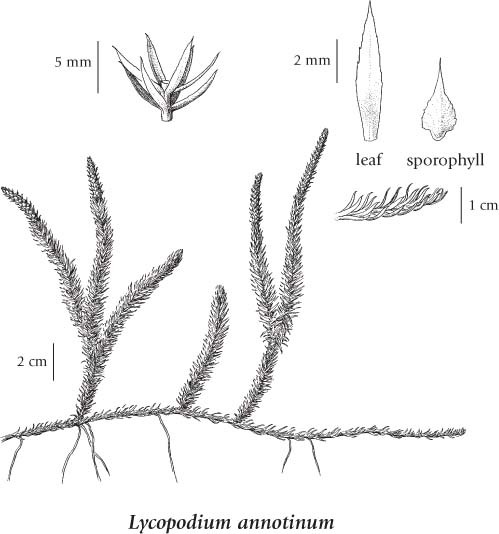 1-4 cm long, single, unstalked at the top of upright branches; sporophylls broadly egg-shaped with fringed margins. A variable species. In this treatment it includes Lycopodium dubium Zoega, which is treated by some authors as a separate species. Dry to moist coniferous forests, heath, wet peat bogs and rock outcrops in the lowland to subalpine zones; common throughout BC; circumpolar, N to AK, YT, NT, E to NF and S to NC, WV, ID, and OR, disjunct in NM; Eurasia. A shade-tolerant/intolerant, montane to subalpine, circumpolar club-moss (transcontinental in North America). Occurs in boreal and cool temperate climates on moderately dry to fresh, nitrogen-medium soils; its occurrence increases with increasing latitude. Sporadic in non-forested communities and in coniferous forests on water-shedding sites (less frequently on water-receiving sites). Characteristic of boreal coniferous forests. Lycopodium annotinum var. alpestre Hartm.